Momentum Telecom develops, streamlines and integrates technology to help businesses communicate better, faster, and more efficiently using the latest in voice, video, mobility and collaboration capabilities. 0	jplist-folder-All-Posts-584 Press-Release-Press-Release	jplist-topic-network jplist-topic-Sdwan	0	04/04/2019 14:47:39	Atlanta – April 4, 2019 – Momentum Telecom, a premier provider of cloud voice, network services and unified communications solutions today announced that it has completed its transaction to acquire Metro Optical Solutions. Metro Optical is a leading provider of managed network, data and internet solutions to enterprise and carrier customers globally. Meet with Momentum in our Channel Partners Cabana! 2	jplist-folder-All-Posts-584 Article-Article	jplist-topic-Channel-Partners jplist-topic-Tradeshows	0	03/04/2019 12:19:39	We are lucky that Channel Partners chooses to host their annual event in Las Vegas. Not only is the conference one of the top meetups of the channel community each year, but the city of Las Vegas has so much to offer from an entertainment perspective. We’ve compiled some of our favorite sights, bites and scenes that you can take part in while you’re in the desert. 3	jplist-folder-All-Posts-584 Product-Literature-Product-Literature	jplist-topic-Phones	0	02/28/2019 07:21:02	Yealink-SoTel buyback program aims to maximize the value of your aging phones and help you upgrade a new business communications system. Our valued customers can now take advantage of trading-in their old desk phones and receive an additional discount on award-winning Yealink phones. 4	jplist-folder-All-Posts-584 White-Paper-White-Paper	jplist-topic-Customer-Service	0	02/28/2019 07:18:14	At Momentum Telecom, we have the industry’s best customer experience and the lowest churn rate because at the core of everything we do is a firm white-glove approach. This stems from our commitment to enabling others to thrive and this design helps us deliver meaningful value through every step of the customer journey. 5	jplist-folder-All-Posts-584 Case-Study-Case-Study	jplist-topic-Ucaas	0	02/28/2019 07:16:17	Ector County is located in West Texas and serves more than 150,000 residents from the county’s largest city and seat of government, Odessa. Founded in 1887, Ector County has been a mainstay in helping both the local and state governments operate and in assisting with economic development, electoral processes, health services, judicial measures, environmental regulations and other governmental responsibilities. 6	jplist-folder-All-Posts-584 Product-Literature-Product-Literature	jplist-topic-network jplist-topic-Sdwan	0	02/20/2019 10:34:50	Your business depends on your network and your connection is vital for generating revenue, communicating with customers, accessing business applications, coordinating with suppliers and achieving success. Ensuring those connections are operating at peak performance, without interruption, 24/7/365 is critical. Enter Software-Defined Wide Area Networking (SD-WAN). 8	jplist-folder-All-Posts-584 Product-Literature-Product-Literature	jplist-topic-voip	0	01/30/2019 15:17:31	It is time to optimize your conference room with Yealink modern conference phone – the Yealink Touch-sensitive HD IP Conference Phone CP920. With user-centric design philosophy, this new release from Yealink combines simplicity of use with sophistication of features, being perfect for small to medium conference room. In regard of its crystal-clear audio quality, your conversation will sound natural and bright anywhere with well-designed CP920. 9	jplist-folder-All-Posts-584 Product-Literature-Product-Literature	jplist-topic-voip	0	01/30/2019 15:16:24	Yealink Wireless DECT Conference Phone CP930W, based on the reliable and secure DECT technology, is designed for wireless communication environments such as small-tomedium meeting rooms and huddle rooms. The CP930W not only ensures you up to 24 call hours, but also deliver the first-rate audio quality to you with the Yealink Noise Proof technology that your conference calls will be filled with the dynamics they deserve. 10	jplist-folder-All-Posts-584 Product-Literature-Product-Literature	jplist-topic-voip	0	01/30/2019 15:15:08	It is time to optimize your conference room with Yealink latest conference phone the Yealink Optima HD IP Conference Phone CP960, comprising the power of the Android 5.1 operating system. With user-centric design philosophy, this Y-shape brand new release from Yealink combines simplicity of use with sophistication of features, being perfect for any team environment, especially for medium to large conference room. In regard of its crystal-clear audio quality, your conversation will sound natural and bright anywhere with well-designed CP960, and beyond that, you can connect an external loudspeaker to it if necessary. The Yealink CP960 provides wireless and wired pairing with your mobile staff – smartphone or PC/tablet via Bluetooth and USB Micro-B port; As a valuable complement for your conference room, Yealink concentrates on users themselves, giving you a easily and clearly engaging business conference experience. 11	jplist-folder-All-Posts-584 Product-Literature-Product-Literature	jplist-topic-voip	0	01/30/2019 15:14:03	The Yealink W56H is the next-generation wireless handset designed for business use with excellent battery life and high compatibility. Combining the benefits of wireless communication with rich business features of Voice-over-IP telephony, it empowers users with convenience of wireless communication that users can enjoy conversations in excellent speech quality, benefit from freedom of movement and its professional features. The attractive design with 2.4” color screen underlined by its modern look is what defines this state-of-the-art VoIP wireless telephone. 12	jplist-folder-All-Posts-584 Product-Literature-Product-Literature	jplist-topic-voip	0	01/30/2019 15:13:05	The Yealink W60P, being a high-performance SIP cordless phone system, is the ideal solution for small and medium-sized businesses. Paring with up to a total of 8 Yealink W52H/W56H DECT handsets, it allows you enjoy superb mobility and efficient flexibility immediately as well as significantly eliminates additional wiring troubles and charges. To provide a better and higher performance, this DECT IP phone not only supports up to 8 VoIP accounts and 8 concurrent calls, but also speeds up its startup and signal connection, slashes its upgrade downtime as well. 13	jplist-folder-All-Posts-584 Product-Literature-Product-Literature	jplist-topic-voip	0	01/30/2019 15:12:13	Yealink SIP-T40G is a feature-rich SIP phone that enhances daily interoperability and unifies communications for busy managers. Designed with a revolutionary new appearance, it supports flexible and secure provisioning (the phone utilizes industry-standard encryption protocols for users to provision and perform software upgrades both in-house and remotely), this advanced IP phone is intuitively designed with ease-of-use in mind. 14	jplist-folder-All-Posts-584 Product-Literature-Product-Literature	jplist-topic-voip	0	01/30/2019 15:11:20	The SIP-T41S is a feature-rich business tool for superior communications and extended functionality. It offers a faster, more-responsive interface than the T41P and several performance-enhancing functions. It’s a six-line IP phone that comes with built-in programmable keys to enhance productivity. 15	jplist-folder-All-Posts-584 Product-Literature-Product-Literature	jplist-topic-voip	0	01/30/2019 15:10:23	The SIP-T42S IP phone is a dynamic business communications tool for superior voice communications and extended functionality. It has a faster, more responsive interface than the T42G and offers better overall performance. 16	jplist-folder-All-Posts-584 Product-Literature-Product-Literature	jplist-topic-voip	0	01/30/2019 15:08:43	The SIP-T46S IP phone is the ultimate communications tool for busy executives and professionals. In addition to offering better overall performance than the T46G, this device has a faster interface with a rich, high-resolution TFT color display. 17	jplist-folder-All-Posts-584 Product-Literature-Product-Literature	jplist-topic-Ip-Phones	0	01/30/2019 15:07:26	The SIP-T48S IP Phone is a dynamic business communications solution for executives and professionals. This phone offers a large touch screen that makes switching between pages and applications swift, easy and convenient. 18	jplist-folder-All-Posts-584 Product-Literature-Product-Literature	jplist-topic-IP-Phone	0	01/30/2019 15:06:11	The Yealink SIP-T58V is a simple-to-use smart media phone that provides an enriched HD audio and video calling experience for business professionals. This all-new smart media phone enables productivity-enhancing visual communication with the ease of a standard phone. 19	jplist-folder-All-Posts-584 Product-Literature-Product-Literature	jplist-topic-Ip-Phones jplist-topic-Phones jplist-topic-voip	0	01/30/2019 15:02:53	Yealink Conference Phones are designed to make remote meetings productive, so you will not have to go through the agony of low-quality sound and annoying distractions. Equipped with full-duplex and HD audio quality, the phones capture and deliver conversation in full sound. Better yet, Yealink has developed its Noise Proof Technology to eliminate possible background noise and provides noise-free services even in a busy environment. The phones automatically mute the microphone when no human voice is detected, and intelligently reduce background noise to a minimum when you are speaking. 20	jplist-folder-All-Posts-584 Product-Literature-Product-Literature	jplist-topic-Call-Flow jplist-topic-Call-Monitoring	0	01/30/2019 15:01:33	Unity Agent is an essential tool in empowering Agents toward optimum call handling efficiency. All information relevant to the incoming caller, the status of fellow Agents and Supervisors, and the overall Call Center situation is presented within a refined business interface. 21	jplist-folder-All-Posts-584 Product-Literature-Product-Literature	jplist-topic-Call-Flow jplist-topic-Call-Monitoring	0	01/30/2019 15:00:25	Unity is a Windows and Mac application that combines call control, Instant Messaging, telephony service configuration, click-to-dial and unified directories to enhance the user experience. 22	jplist-folder-All-Posts-584 Product-Literature-Product-Literature	jplist-topic-Call-Flow jplist-topic-Call-Monitoring	0	01/30/2019 14:58:20	Unity Reception is designed to support even the busiest front desk environments. Featuring a modern and user-friendly interface, Unity Reception improves call handling and customer service for customer facing and front desk attendants. 23	jplist-folder-All-Posts-584 Product-Literature-Product-Literature	jplist-topic-Call-Flow jplist-topic-Call-Monitoring	0	01/30/2019 14:56:42	Unity Supervisor is a powerful reporting and management interface that gives Supervisors and team leaders relevant, real-time, performance information on Agents and queues, presented in a concise and intuitive table format. 24	jplist-folder-All-Posts-584 Product-Literature-Product-Literature	jplist-topic-network jplist-topic-Sdwan	0	01/30/2019 14:51:36	Your business depends on your network and your connection is vital for generating revenue, communicating with customers, accessing business applications, coordinating with suppliers and achieving success. Ensuring those connections are operating at peak performance, without interruption, 24/7/365 is critical. Enter Software-Defined Wide Area Networking (SD-WAN)! 25	jplist-folder-All-Posts-584 Video-Video	jplist-topic-Case-Study jplist-topic-Ucaas	0	01/30/2019 14:50:01	Two Men and a Truck is one of the largest moving and relocation franchises in the world. Momentum Telecom helped them to transform their business through the use of Hosted VoIP and collaboration tools, as well as improving the call routing functionality of their contact center. Momentum also customized an IVR to help with geo-routing incoming calls and gave their remote employees the tools they needed to work seamlessly with the Lansing, MI, headquarters. The new UC solution has enabled their business to thrive and helps support their long term scalability. Learn how Momentum designs our networks to offer full resiliency to protect against downtime and outages. 27	jplist-folder-All-Posts-584 Video-Video	jplist-topic-network jplist-topic-Ucaas	0	09/07/2018 10:45:24	Learn how Momentum designs our networks to offer full resiliency to protect against downtime and outages. 28	jplist-folder-All-Posts-584 Video-Video	jplist-topic-network jplist-topic-Video	0	09/07/2018 10:10:42	The key to keeping business networks up and running is network diversity - designing failover processes to ensure redundancy and keeping business voice and data up and running. 29	jplist-folder-All-Posts-584 Video-Video	jplist-topic-cloud jplist-topic-network jplist-topic-Security	0	09/07/2018 09:46:39	We design our infrastructure to meet the highest quality standards for service delivery. While this can sound complicated, our six basic principles are fairly simple. Learn more here. 30	jplist-folder-All-Posts-584 Video-Video	jplist-topic-cloud jplist-topic-network	0	09/07/2018 09:42:03	With today's threats online, security is of the utmost importance. We secure our services using best of breed tools and methodologies in order to provide our customers peace of mind. 31	jplist-folder-All-Posts-584 Video-Video	jplist-topic-network jplist-topic-Video	0	09/07/2018 09:35:36	We design our services to be as close to 100 percent operable as possible. Our customers expect it, and we deliver it. We make sure all links in our chain our strong in order to offer maximum uptime. 32	jplist-folder-All-Posts-584 Press-Release-Press-Release	jplist-topic-cloud jplist-topic-Press-Release jplist-topic-Trustedsky	0	09/05/2018 14:12:10	BIRMINGHAM, Ala. – August 22, 2018 – Momentum Telecom has announced that they have joined the Telarus TrustedSky Alliance in a step that further distinguishes the company’s status as the industry’s customer experience leader. Having already completed the necessary modifications and enhancements in their data centers, Momentum is ready to provide partners with an even greater control along with increased insight and more tools for managing Momentum’s cloud-based communications solutions. TrustedSky is a web-based testing platform that ensures businesses are receiving the best possible experience by enabling partners to test and diagnose their customers’ network capabilities and performance. This functionality provides the crucial knowledge that IT staffs and partners need to act both independently and autonomously and will inherently lead to faster and more comprehensive service resolutions. “This simple, yet powerful technology firmly places visibility and insight in the hands of partners,” said Momentum EVP of Technology, Mark Marquez. “Now, a few mere clicks performs a ‘pitch and catch’ test that sends test VoIP packets over the network all the way to the Momentum data centers and then quickly returns results that can be used to identify the correct party, whether it’s the internal IT department, the ISP or Momentum, to contact for assistance.” In addition to the network management benefits, through TrustedSky, Momentum will have a larger portfolio of tools that will continue to simplify and expedite the provisioning, implementation and deployment process of their solutions. “At Momentum, we are known for our unmatched customer experience with white glove implementation, training and ongoing support,” said Momentum Executive Vice President of Sales and Marketing, Chuck Piazza. “So adding Telarus’ TrustedSky to our already celebrated network was a natural step forward for us in our continued our commitment to having both the industry’s most satisfied and empowered customers and partners.” For more information about Momentum Telecom or the TrustedSky announcement email sales@momentumtelecom.com or call 877-251-5554. # # # Momentum Telecom is a premier provider of Business Voice, BBX Broadband Management and Unified Communications solutions. Momentum’s solutions offer smart, customizable cloud-based applications including voice, video and collaboration tools that enhance business productivity and efficiency for direct customers and more than 500 nationwide white label and channel partners. Momentum Telecom is committed to delivering best-in-class products backed by a geo-redundant network paired with industry-leading uptime and customer service. 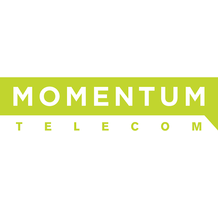 Headquartered in Birmingham, AL, Momentum Telecom has regional offices actively serving customers across the United States. To learn more visit momentumtelecom.com or connect with us on Facebook, Google Plus, Twitter, LinkedIn or visit our blog. At Momentum Telecom, our mission is to enable others to thrive by combining smarter technology with seasoned experts while delivering unmatched customer experience. What you need to know to educate customers on this new tool! Momentum Mobility View wins Product of the Year! Momentum Mobility View wins 2018 TMC Product of the Year! 36	jplist-folder-All-Posts-584 Press-Release-Press-Release	jplist-topic-cloud jplist-topic-Hosted jplist-topic-Mobility jplist-topic-Ucaas jplist-topic-unified-communications jplist-topic-Voice jplist-topic-voip	0	07/17/2018 14:04:42	Momentum Mobility View wins 2018 TMC Product of the Year! 39	jplist-folder-All-Posts-584 White-Paper-White-Paper	jplist-topic-business-voice jplist-topic-Cloud-Voice jplist-topic-hosted-voice jplist-topic-pbx jplist-topic-Ucaas jplist-topic-Voice	0	05/16/2018 13:24:06	Enterprises are learning that embracing modern technology and moving to the cloud allowsfor the transformation of how they communicate, collaborate and conduct business. 41	jplist-folder-All-Posts-584 White-Paper-White-Paper	jplist-topic-HIPPA jplist-topic-Hippa-Compliance jplist-topic-hosted-voice jplist-topic-voip	0	06/20/2017 12:19:17	Is there such a thing as “HIPAA certified?” Download our white paper to discover why telecom providers DO NOT need to be HIPAA compliant. Is there such a thing as “HIPAA certified?” Download our white paper to discover why telecom providers DO NOT need to be HIPAA compliant. Learn more by downloading the product sheet. 42	jplist-folder-All-Posts-584 jplist-folder-All-Posts-584 Product-Literature-Product-Literature	jplist-topic-business-voice jplist-topic-email jplist-topic-Transcriptions jplist-topic-unified-communications jplist-topic-Voicemail jplist-topic-voip	0	03/07/2017 17:56:49	Learn more by downloading the product sheet.